*HOT* Italian Peperoncino Garlic Agrumato (Fused) EVOO – Olive That! A perfect harmony of hot red peppers and Italian garlic! The flavor has the heat; an immediate zing of hot pepper that builds and lingers, with a pleasant but not too intense garlic flavor. 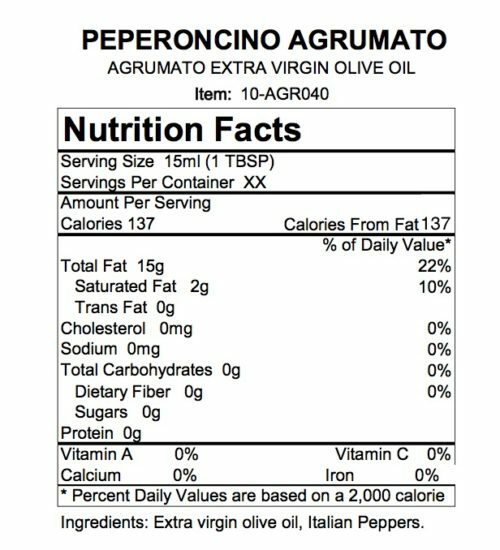 Harvested and produced using traditional granite millstones in Italy, this all natural peperoncino agrumato extra virgin olive oil is produced by crushing the olives, hot peppers, and garlic simultaneously in the same press without the use of any added essences. This process allows for the essential oils from the peppers to harmonize with the oil from Coratina olives (which lend a hand in the heat behind this oil!). The producer hand harvests olives from Andria, near the Adriatic coast.